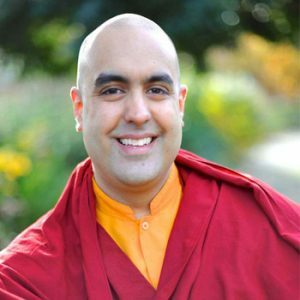 Brought up in London and educated at Oxford University, Gelong Thubten became a Buddhist monk 25 years ago at Kagyu Samye Ling Tibetan Centre in Scotland, Europe’s oldest Buddhist monastery, when he was 21 years old. His training has included spending over six years in intensive meditation retreats, the longest of which was 4 years, and he has been teaching Buddhism and meditation for 20 years. Years before the current mindfulness trend emerged, Thubten began to teach mindfulness and meditation to doctors, nurses and administration staff at hospitals in Wales and London, as well giving courses in prisons, addiction counselling centres, schools, universities and the corporate world. He continues this work internationally, with clients such as Google, LinkedIn, Lloyds Bank, Deutsche Bank, Siemens, Accenture, the NHS and law firms such as Clifford Chance. He has lectured on Buddhism and meditation at the universities of Oxford, Cardiff and Helsinki. He teaches staff and pupils in several schools, and he designs and delivers 12 week mindfulness programmes for 4th year medical students at the National University of Ireland, as part of their degree. Thubten is the director of two meditation centres in the U.K., and was recently the mindfulness consultant on the set of Marvel’s latest movie, Dr. Strange, where he trained Benedict Cumberbatch and Tilda Swinton in meditation techniques while they were filming. He has co-authored a book on mindfulness and the brain with Ruby Wax and the neuroscientist Ash Ranpura.